New Year’s Day is one of my favorite holidays. I have great memories of a day full of football, and my Grandma Mary’s roast pork and Romanian sausage dinner. I don’t want to hear from my food blog responders about the cholesterol content of those items. It was tradition and only once a year. And according to Grandma, if you ate any poultry on New Year’s Day, you were going to itch for the entire year. The other part of New Year’s Day that I continue to love is that it is a point in time for reflection and renewal, as well as resolution. I have made my share of failed resolutions: the weight loss target that seemed to be lost by Super Bowl Sunday; the promise to stop using four-letter words while yelling at the televised football game, which generally lasted through the first quarter of the Michigan game; and so on. One resolution that I have kept every year is to thank, challenge and hopefully inspire my family, friends and colleagues, as well as myself, to reaffirm what are our core values and beliefs. I’m a big “belief” person. I use the term a lot in describing what we do in health care and, specifically, what we do at Henry Ford Hospital and Medical Group. 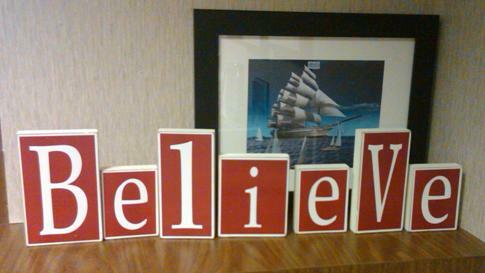 My wife bought me a set of blocks (see above photo) that all who come into my office can see. I think brands are great business advantages, but the relationships of patients and their care providers, and the relationships of health care workers and their place of employment, are predicated on belief – not brand. Those beliefs are powerful forces that drive emotional engagement in this most human of all enterprises. Over the holiday, inspired by what I see everyday on this campus and galvanized by a chance reading of a quote by Eleanor Roosevelt, I thought about a message of belief to send to all of our leadership in a holiday card. I have to admit that timing IS everything!! I have to tell you that I absolutely LOVE coming to work everyday, and I can honestly say that all of my days at the hospital are enjoyable. Today, however, was probably one of my most trying to date. Driving home on the freeway, I noticed the Mega Millions billboard had decreased and I thought to myself, “Well, someone is happy tonight.” After the day I’d had, I began to daydream about what I would do with all of that money. It was easy: I would work part-time as a staff nurse somewhere and not have to worry about staffing, budgets or joint commission. I arrived at home and was scrambling to think about what to make the kids for dinner. My husband, Miles, is deployed presently, so I am mom and dad, repair person, etc., until June. Papa Romanos sounded perfect. I could let THEM cook tonight for me! I brought the food home, quickly dressed into my workout clothes and ran to the gym for my class. Then I opened your card. Wow! What a nice envelope to end with!! I guess I just really wanted to thank you. Thank you for doing such a great job in your new CEO position. Thank you for REALLY caring about all of us managers. Thank you for taking the time to come see my staff on midnight rounds and listen to their concerns. But most importantly, THANK YOU for sending such a very thoughtful New Year card to me on a day that I needed it the most! So as I wind down for the evening, getting my lunch, uniform and schedule ready for another great day downtown on B4, I go to bed smiling, forgetting about the lousy day I’ve had and looking forward to tomorrow. I, too, hope that you and your family had a blessed holiday and that you all will have a wonderful 2011! Thanks for ending my day on a positive note!! This entry was posted in Believe, CEO, Employees, Holiday Care, Patient Care and tagged CEO blog, Doc in the D, docinthed, Dr. Popovich, Henry Ford, henry ford hospital, Holidays, hospital mission, John Popovich, New Year by Dr. John Popovich. Bookmark the permalink. Thank you Dr. Popovich for keeping us at HFHS grounded, centered, and focused on what truly matters. Your reflections give us a “double dose” of inspiration in less than 24 hours coming right after president Obama’s memorial speech last night in Tuscon, Arizona!